Over the last few months ARAN has been extremely active in highlighting its campaign to ‘Stop Circus Suffering in Ireland’ with ADI and, as a result of this, has received increased national and local press coverage, helping to further highlight the plight of animals in the travelling circus. 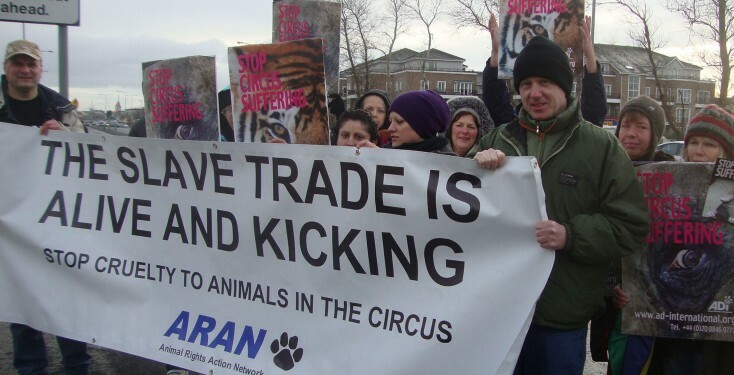 ARAN is also stepping up its lobbying campaign of Irish councils – already Waterford, Drogheda, Galway and Kilkenny are looking to introduce motions to ban animal circuses, with other Councillors interested in putting similar Motions through. ARAN is confident that, by the end of 2012, animal circuses in Waterford will be illegal. Local campaigners have been busy gathering signatures to present to the council to help push the legislation through. ARAN supporters staged a vibrant demonstration outside the notorious Courtney Brothers Circus in Drogheda, attracting media attention which prompted the local Mayor to support the campaign to ban animal circuses there. ARAN are also continuing to hold successful outreach events in schools, facilitating changes in public perception as to the use of animals in circuses.